The India Today-Axis My India exit polls have predicted a decisive victory for the TRS when the election results for the Telangana state assembly polls are declared on December 11. 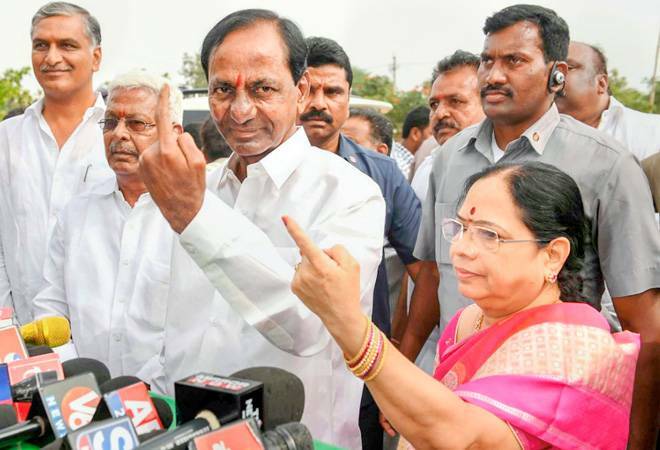 Telangana seems to have favoured its first Chief Minister K Chandrashekhar Rao once again, as the exit polls put his Telangana Rashtra Samithi (TRS) in a clear lead in the 2018 state Assembly elections. The India Today-Axis My India exit polls have predicted a decisive victory for the TRS in the election for the 119-member Telangana state Assembly. The India Today-Axis My India exit polls have foretold TRS winning a minimum of 79 seats and as much 91 seats in the 2018 Telangana Assembly elections. The halfway mark for the 119-seat Telangana state Assembly is set at 60 seats, which put the KCR-led regional party into a comfortable position. The party could command a vote share of 46 per cent, the exit polls suggested. The alliance between Chandrababu Naidu's Telegu Desham Party (TDP) and Congress has emerged as the second-biggest contender for power in the state with 21 to 33 seats, and could get a vote share of 37 per cent, says the survey. The Bharatiya Janata Party (BJP) might remain a footnote with victories in one to three seats and a vote share of seven per cent, whereas the Assauddin Owaisi-led AIMIM is set to win anything between four to seven seats and a vote share of three per cent. The state of Telangana went to polls to Friday, where almost 67 per cent voters exercised their right to vote. The counting of votes for the Telangana will happen on December 11, along with four other states - Rajasthan, Madhya Pradesh, Mizoram and Chhattisgarh.